10.03.2015: Does Earth have an expiration date? Chart on runaway warming of the Arctic circulated by the Arctic methane Emergency Group. One of the confounding realities of global warming theory has been that nobody with the requisite knowledge of the science really wants to put a date on when an ‘Extinction’ event will occur. As I noted in an earlier post, there is even a great reluctance about using the E word–even when all the evidence points toward full-blown cessation of life on the planet, the scientists (and the reporters who write about them) are reluctant to put that particular word in their stories. There have been various attempts to put deadlines on action (‘if we don’t seriously reduce our carbon dioxide levels, our grandchildren will be in big trouble by 2100’ is a popular bromide). Understand, every non-change denialist who has an interest in the subject of human extinction (that would be all of us except the NTHE crowd) has been pushing that ‘if we don’t act we’ll be in real trouble by 2100’ meme for all it’s worth. With that deadline 85 years away, the tendency is to become complacent. But nearly all such assertions about a 2100 deadline are based on carbon concentrations alone. The 2100 deadline misses what Guy McPherson has pointed out as the numerous feedback loops that have been triggered by the warming of the climate by a mere .85 c over the numbers we had at the beginning of the Industrial Revolution and the growing use of fossil fuels (first coal, then oil). Feedback loops include wildfires that cannot be extinguished because they occur in areas with widespread drought; loss of albedo in soot-covered glaciers, meaning the ice is absorbing radiant heat instead of reflecting it back into atmosphere; and die-off of trees caused by both increased heat and more exposure to destructive species (warmer winters mean more beetles around to feast on trees when spring arrives). But the biggest feedback loop–the elephant in the room–is the largely undiscussed impact of methane releases as a result of warming. Methane is a much more powerful greenhouse gas than Carbon Dioxide (though it deteriorates much faster), and the methane presence in the atmosphere (though measured in parts per billion) has nearly tripled in the years we’ve been running industrial society. In the chart above, we see that methane is up to 1850 parts per billion, as opposed to six hundred or so, the norm in pre-industrial times. 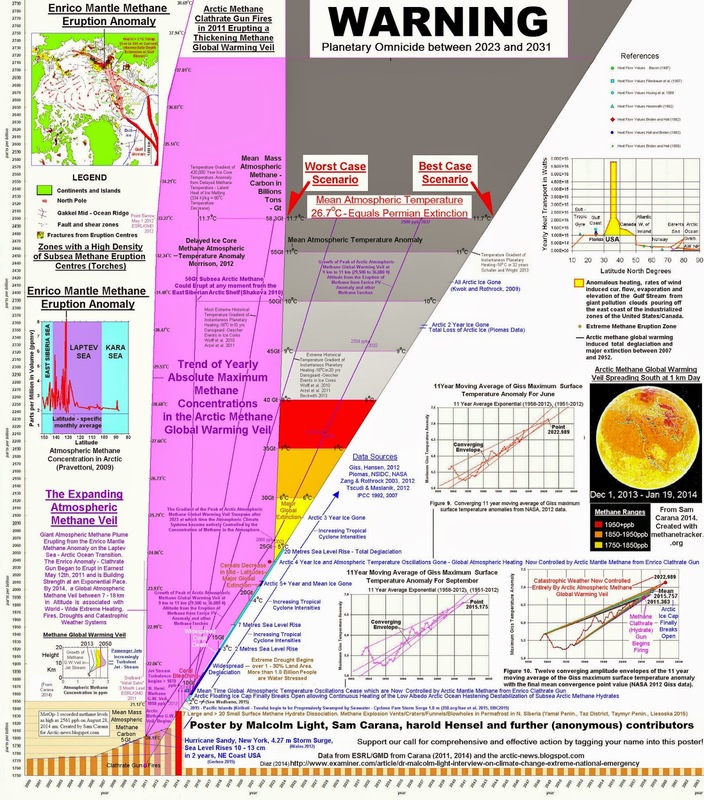 Experts like Natalia Shakhova have been talking about the thousands of Gigatons of methane sequestered under the the Arctic, and the disastrous consequences for the climate should even a few percent of that methane escape as a result of the melting of the clathrate. And so, when Dr. Malcolm Light posted the following in FaceBook recently, my radar went up: “50 years of Giss temperature data from the Goddard Research Space Centre fix the time when global warming will go into runaway mode because of Arctic methane expulsion as October 3, 2015. The catastrophic droughts, fires and high temperatures this year make it very likely. In Saudi temperatures as high as 65 C are expected (149 K). Humans can not survive in these temperatures without air conditioners and it represents the start of oil generation from organic matter to oil geochemists. This means that even 8 years may be an overestimate before we are subjected to widespread extinction on the planet.” Dr. Light has done the necessary work(here) to show how this is possible. This is a terribly granular prediction–it reminds me of the seventeenth century assertion of Bishop James Ussher, the Protestant Irish Cleric who so precisely stated the beginning of the earth. “Ussher wrote: “In the beginning, God created heaven and earth, which beginning of time, according to this chronology, occurred at the beginning of the night which preceded the 23rd of October in the year 710 of the Julian period.” In the right margin of the page, Ussher computes the date in “Christian” time as 4004 B.C. His assertions figured into the Scopes evolution trial and may be familiar to those who’ve watched Inherit the Wind, the theater and movie adaptation of the trial. And yet, the prediction about runaway methane release and the month of October dove-tails with recent stories on Arctic news, one of the many Arctic-related blogs edited by a man named Sam Carana (you can see his name in the graph above). The article here points out the likely end of Arctic sea ice come September. A number of other scientists have made similar predictions–David Wasdell of the Apollo-Gaia project had laid out a similar prediction a couple years ago. The Arctic News group had laid out the problem earlier this year. 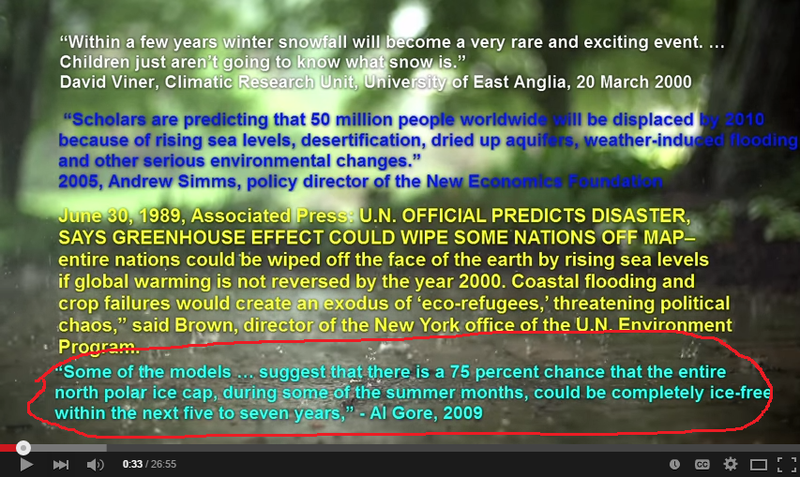 the screen from the Lord Monckton climate change denial video. Note the circle at the bottom. Al Gore has been pilloried by lots of right-wingers for stating in 2009 that the summer ice could be gone from the Arctic ‘in five to seven years’. But he’s got til 9/2016 to be wrong. And if you read the chart above (and follow the links or use the Mister Google page), it looks like the former VP nailed it. In other words, if the scientists in question have this right, the October third date will be the day when we can’t do anything at all to fix our situation. In the meantime, the news from the North is not good. Once the ice is gone and the ocean is absorbing all of the sun’s heat, the question is no longer if we’ll release the undersea methane, but when–and the month of September is looking like the last chance to get anything fixed. I always end these sorts of ruminations with the hope that everyone writing about these subjects is wrong. But having a convergence of scientists discussing the release of the methane clathrates is worrying to say the least. With warm water infusion into the arctic and the fact that the shelf is ~ 50 ft deep, the CH4 trigger appears to have already been pulled. I don’t disagree with you, Francis. But I’m a lowly artist–I dance, I sing, I do the simple monologue. I don’t have the science credentials that the people who posted the above chart possess. The drop-dead nature of the data presented on the chart, plus the granular nature of Dr. Light’s prediction, makes me side with him insofar as what my post addresses is the absence of any way to reverse runaway climate change once all summer ice is gone from the Arctic.